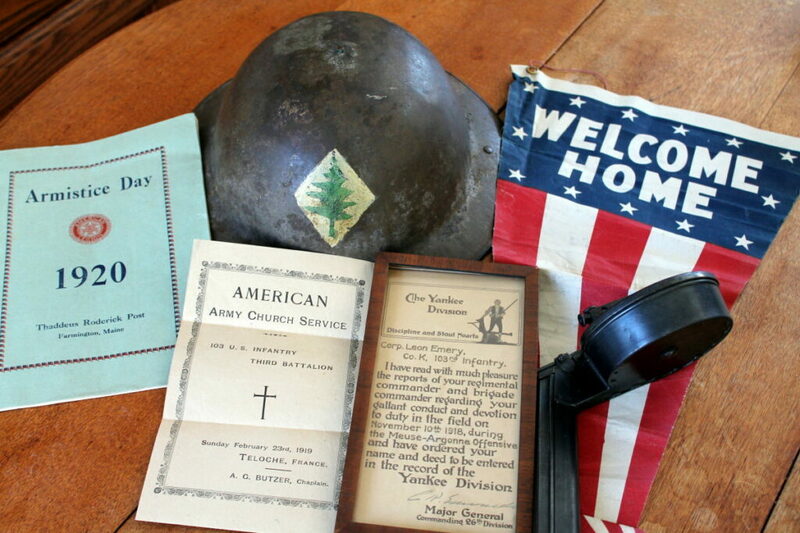 Steve Etzel went into the attic looking for a leaf for the dining room table and stumbled across a suitcase packed with World War I memorabilia belonging to his grandfather, Leon Emery. 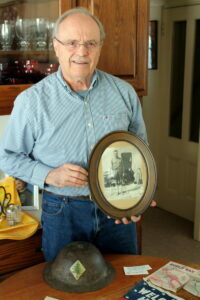 FARMINGTON — Steve Etzel was searching through the attic of his childhood home on Anson Street exactly one month ago. He was looking for a leaf for his dining room table but as he rifled through items collected and stowed away by the generations before him, a pair of suitcases caught his eye. The first, he said, was empty. However, as he lifted the second, he could tell by the weight that something was stored inside. As he unlocked the latches and raised the lid, he was greeted with an exhibit of personal and historical documents, artifacts and memorabilia that belonged to Etzel’s grandfather, Leon Emery, from when he served in the Army during World War I.
Emery was born in 1895 and lived on a farm in Industry. He would stay at boarding houses in Farmington while attending school. Since farm chores took priority, it was a long process to graduate, Etzel said. It was during one of these stays at a boarding house that Emery met Lelia Hatch, who would become his wife. During World War I, Emery served with the 26th Division, 103rd Infantry, Company K and spent time in France. 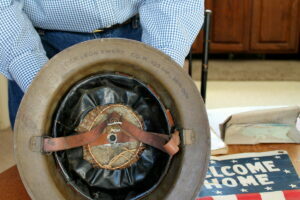 Amid personal papers and mementos from his time overseas, Emery packed away his helmet, gas mask, part of a rudder from a French fighter plane and artillery shells. He also saved local newspapers announcing the departure of local troops and a program for the Farmington Armistice Day celebration in 1920. The program from the 1920 Farmington Armistice Day celebration lists a parade route that zigzags through a number of downtown streets including High, Broadway, Main, Anson, Court, Perham and Quebec. “It just kept going and going,” Etzel said. Notecards packed away among the mementos indicate at least some of the items were on display at some point, but Etzel is not sure where. Most of the artifacts are in excellent condition for their age and such casual storage techniques. However, some of the artifacts, including the canvas fighter plane remnant are fragile and in need of professional preservation. Etzel has been in contact with Secretary of State Matthew Dunlap to help determine where the items would best be housed. Etzel grew up in the family home and lived in Lewiston before moving back about seven years ago to help care for his mother and father, who are now deceased. The house, he said, contains a lot of family history, but he was surprised to uncover something with such historical significance.